Favourite Tokens: CryptoWave has not listed any favourite tokens. There is more to see on CryptoWave's profile, please login to get access. I have not been around for a long time. The truth is that I'm pretty busy, but I'm still alive. @ManiMoto :D Although I have not had time to enter .. I keep reading each of your publications. Wish you all the success in your endeavors my friend. 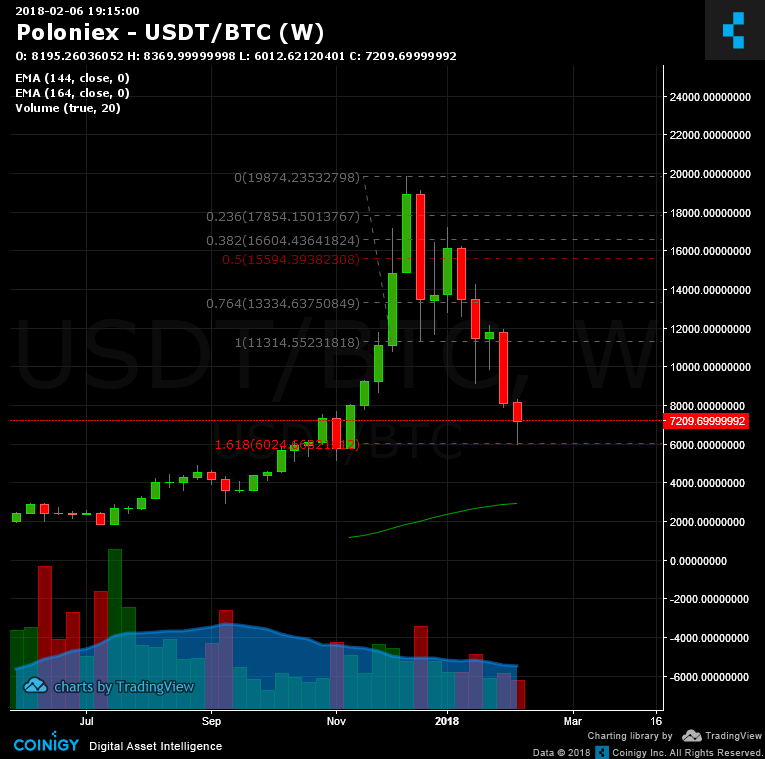 BTC stopped at extension fibo 161.8 of the weekly TimeFrame. look @ the monthly fib re-tracements however. I think I should of picked up more eth last night. Just wait for tonight or tomorrow, we have not reached bottom. You guys want to see it go lower? HOW MUCH LOWER CAN THIS POSSIBLY GO!!!!? $6000-$5500 is pretty strong support, but previous support levels have had little meaning these past few weeks, so who knows. And we have BTC below 7000, seems that nothing can stop cryptos falling to 0 ! @CryptoWave But all supports get broken one after the other ! This ain't traditional stock market or Forex ! If it still go like this, nothing will be left of this market. @gab2201 If the fall is over or not, nobody knows. You can only see what the price is doing and establish zones where that probability increases. 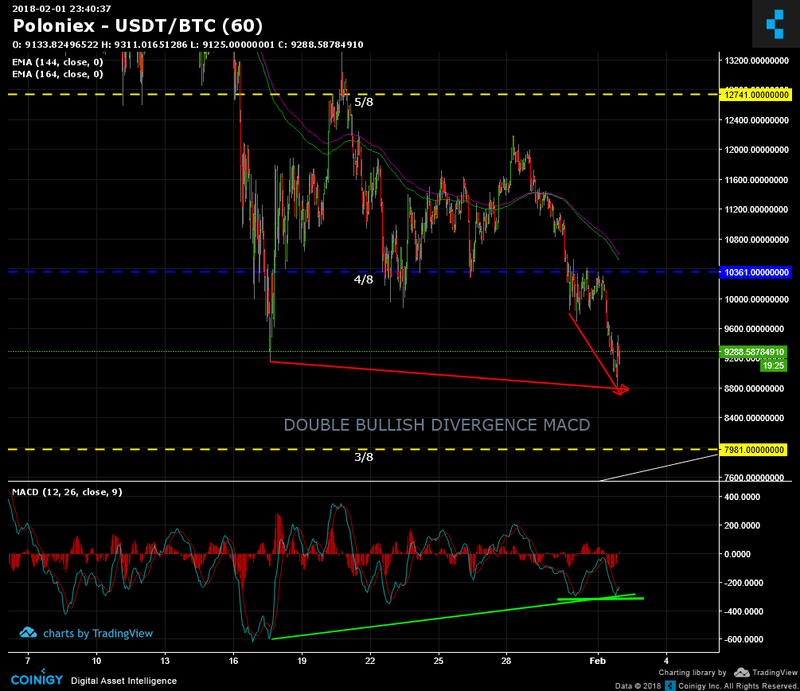 In the short term BTC is bearish, and in the long term we are suffering a correction of a previous uptrend. The MACD is bearish from the weekly chart to the smaller TFs. It is true that there are upward divergences that are indications that a change must be near, however the divergences alone are only indicative. A correction of more than 60% begins to be dangerous. No one can say now that the price will reach 6500 and go to the moon. The price may rise to 10,000 and fall back to 5,000 or lower. @CryptoWave Like you say, a correction of more than 60% is dangerous. BTC and crytpos could also be a new tulip bulbs bubble that just blew once and forever. BTC could go back to 20'000 USD like to 1 USD ! @gab2201 Historically BTC has had falls like this and has always recovered. I do not see a possibility $ 1USD. Personally I think it will end up recovering. When the market is falling, buy in the support and sell in the nearest resistance. When that support breaks, it becomes resistance. Then buy in the following support and sell everything in the support that broke and that is now a resistance. what tools are you using to identify support and resistance? Can't decide if it's time now or if it's dropping further. We aren't quite to the lows of Friday, but it may just not get there. Good deals to be had right now either way. It seems that each day is a new buying time ! If you are day trading no. If you are looking for long term, everyday is a good day to invest. When the market is falling, buy in the support and sell in the resistance. When that support breaks, it becomes resistance. @James Before I could insert an image in the post and it could be visualized. Now I have not been able to do it .. Is there an issue or have you eliminated that functionality? And then? Will it take me to lambo land? At the moment I go alone for a target of 10% target $ 10,800 ..
CryptoWave has no friends on Altpocket.